Brew of The Day: The 2013 Giving Journal by Coffee Bean and Tea Leaf is Here! The 2013 Giving Journal by Coffee Bean and Tea Leaf is Here! 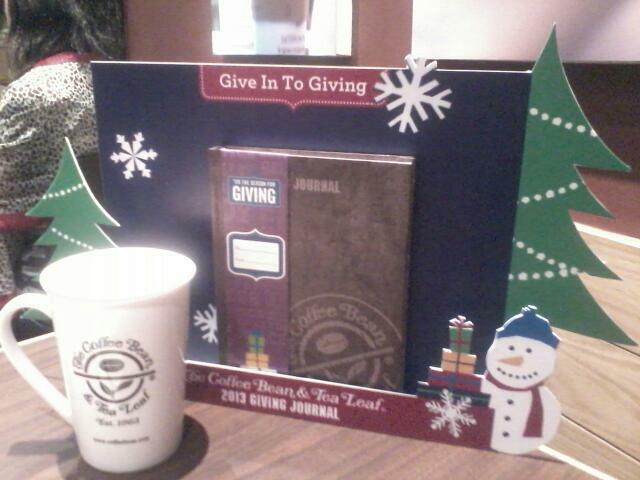 CBTL's 2013 Giving Journal comes in 2 colors this year! Dark and Light Brown. I like the darker one. What's your pick? HEY COFFEEHOLICS! Guess what? Giving Back is Easy with The Coffee Bean & Tea Leaf's 2013 Giving Journal. 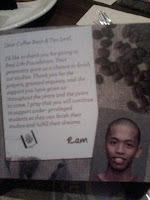 Now that CBTL is having its 10th year anniversary here in the Philippines (its 50th abroad! ), CBTL will be spreading the cheer early by handing out the stamp cards as early as this October 31, 2012! Yay for us coffeeholic addicts and collectors! and its 10th year here in the Philippines! A brand built on compassion, The Coffee Bean and Tea Leaf has long supported charities, foundations, schools, and other organizations in need. 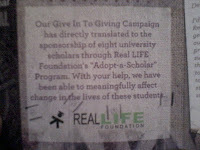 The CBTL continues its support for the Real LIFE Foundation by dedicating proceeds from the Giving Journal to the organization. AND get this, CBTL's President, Walden Chu, shares to us that this year, they've decided to make it easier for people to share the gift of giving by lowering the number of stamps to just TWELVE (12)!!!! CBTL wants us all to be inspired to share in our passion for genuine kindness all throughout the year. 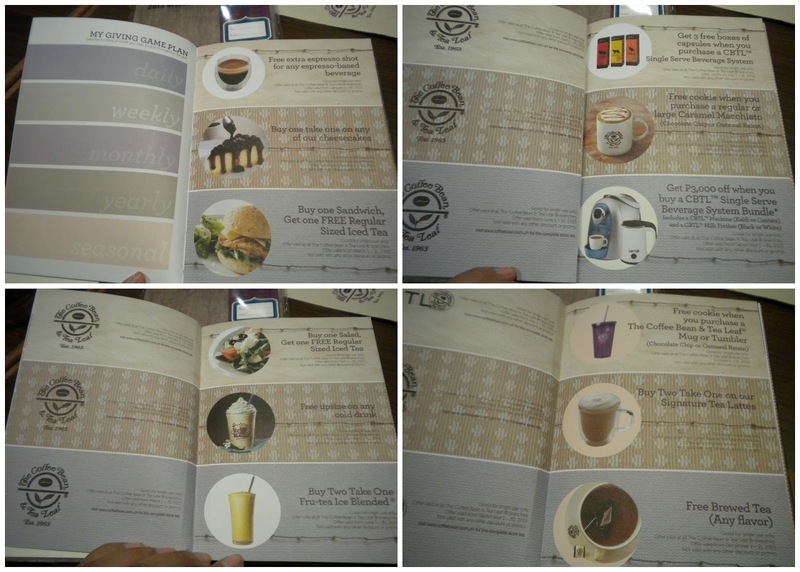 to get your CBTL Giving Journal! To get that stamp, you just need a minimum single-receipt purchase of any Original Ice Blended, Coffee-based, or Tea-based Beverage, or Frozen Swirl and it qualifies you to get a stamp card and a stamp on a corresponding box or circle rather on that card. The drink assignments per "circle" is simple! All you need to do is get 1 Original Ice Blended, 1 Espresso Drink, 1 Tea Latte, 1 Red Velvet Hot Cocoa or Red Velvet Ice Blended, and 8 of any of the aforementioned drinks. Fill up all 12 and submit the card to the nearest CBTL store and you get the journal. Easy Breezy right? The CBTL journal comes with a "gift tag" with a TO and FROM label. So you can actually give this as a gift this Christmas! Isn't it neat? :) Love it! The CBTL Journal has become more than just something to write our thoughts on. The Giving Journal has pages upon pages of great features centered on giving back. The 2013 Giving Journal has sheets that show moments where the brand has helped many of its loyal customers carve out their own way of kindness in the hearts of many, making it the perfect avenue for people to embark on a journey of giving. 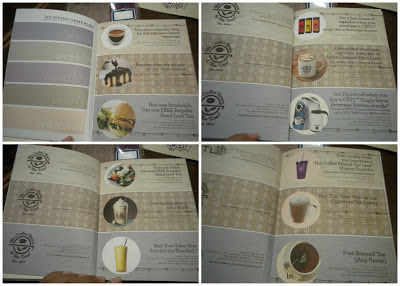 Oh and another notable feature for CBTL's Giving Journal is the monthly coupons which I find one of the awesome things that makes us keep coming back for more of CBTL. They not only inspire generosity but also give generously even to us their customers! Love it! Thank you CBTL! I'm one HAPPY COFFEEHOLIC! Oh and yes my dear coffeeholics, I am absolutely thrilled to be part of the first group of people to get their hands on the journal! Teeeheee.. kinilig ako! haha. I've been an avid fan of CBTL for AGES! Ever since they first started to give out notebooks years ago (anyone who has that give me a holler! :P), I've been collecting their stuff ever since. I've got the red notebook.. and the black and white one! 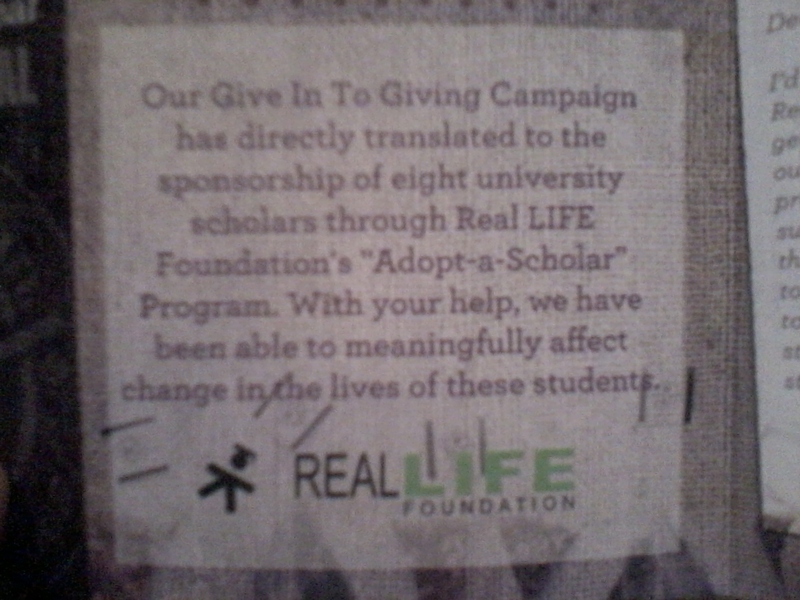 And yeah I definitely got my hands on the very first giving journal by CBTL. I really love their concept and how they really focused on the giving part and even encouraged their loyal customers to be givers as well. That's why I didn't mind spending lots (ahaha.. oy totoo diba.. pinagiipunan pa yung pang gastos nyan!) to get me some stamps to be able to claim my journal. Coz I know the money I spend means also money to be given to others! Scholars pa at that. The wonderful team who were with us at the CBTL branch of Robinson's Magnolia were kind enough to explain that at each stamp card was a thank you letter from some of the scholars who were a recipient of the Giving Journal proceeds last year. It definitely stirs up one's heart to know that even through this we can help. CBTL's RED VELVET Hot Cocoa is back! While there, we were also treated with Coffee Bean and Tea Leaf's the Holiday drinks and sweets for this Christmas! So those RED VELVET fans of last year, well don't fret coz its back again for this Holidays! Red Velvet Hot Cocoa and Red Velvet Ice Blended is back for all of us to enjoy this Christmas season. Yummy Holiday Treats from CBTL! All of you sweet tooths out there, its time to also have a taste of CBTL's divine sweet treats! This Christmas CBTL will be having three new desserts to tantalize us -- Chocolate Caramel Fudge, Raspberry Chocolate Cake, and Rum Cake. YUM YUM YUM! Promise.. it smells like rum! Plus it has some walnuts underneath that icing making it super yum! My personal favorite is the RUM Cake! I absolutely love it. Its not that sweet and it definitely makes you want some more. The first two cakes only cost P135 while the Rum Cake is P115. Well, if I gain weight this Christmas now you know the culprits! LOL! So what are you waiting for Coffeeholics? Seriously, head to the nearest Coffee Bean and Tea Leaf shop NOW and spread the gift of giving! Happy Holidays coffeeholics! Don't forget to check out Coffee Bean and Tea Leaf Philippines Facebook and Twitter!